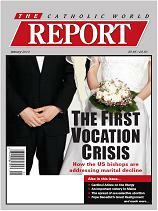 Friends, many of you know about Ignatius Press’ magazine Catholic World Report. It’s completely online now. I’m writing to encourage you to sign up for the free Catholic World Report email newsletter. It’s sent out weekly to alert people to outstanding articles, interviews, and other features on the new, free, online edition of Catholic World Report. Best-selling author Carl Olson is the editor of Catholic World Report. My daugher Catherine Harmon is the managing editor. Together they put out one terrific online Catholic magazine, with superb writers addressing must-read-about topics. Would you take a moment to sign up for the e-newsletter? I guarantee you’ll find Catholic World Report stimulating, informative, and faith-building. And who can’t use a little faith-building in the upcoming Year of Faith? It’s quick and easy. Please pass this email on to interested friends. Thanks very much. STEVE RAY HERE: I find this on line magazine invaluable. Give it a try! I like the catholic world report magazine.